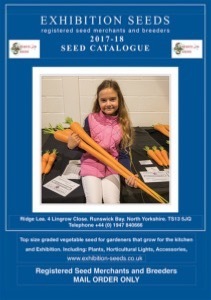 As from 22/08/2017 we are now known as Fosters Seeds , for many years we were known as Exhibition Seeds but we felt that name was denoting that we only sell vegetable seeds for growers who grow for the show bench but in reality, we sell many vegetable seeds mainly aimed at gardeners who grow for the kitchen . We are breeders of fine Exhibition strains too. Nothing as really changed though , we are still the same company with the same quality seeds and plants, we can assure you of the same personal service. Our Fosters Seeds 2017 - 2018 catalogue has been professionally printed and gives you an insight into some of the quality products we sell at Fosters Seeds. Growing giant onions from seed to show bench, tips and recommendations. 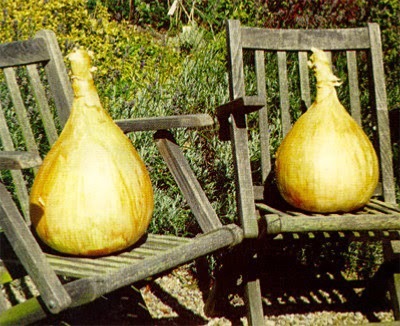 Our new Giant Onion Seeds are ready now, order your seed to be sure of an early start. Many growers ask me how the top growers prepare for growing giant onions, it's not all that difficult but it is expensive when compared with just growing your regular 5lb bulb for the local show. It is essential to obtain the correct strain of onion seed, many merchants, particularly on Ebay are offering giant onion seeds, but be aware, many are not what they say they are, even more worrying is they are not even registered seed merchants. Here at Fosters Seeds our Giant Onion Seeds are a proper registered strain and proven since 1986 to be outstanding record breakers. Our strain Ailsae was trialed over many years under the EU Standards at cost of many thousands of pounds. Our giant onion strain Ailsae is distinct from The Kelsae in that it will grow much bigger given the correct culture. Traditionally most onion growers start their giant onion seeds around Boxing Day 26th December, you wont grow giant onions from such a late sowing, they have to be sown around early November under grow lights. Think about giant onions this way , you must get them very large early, when I say early I mean around 28 inches in diameter by the end of June to have any chance of achieve 18lbs + Onions never ever grow on much after this date. We recommend a good Grow Tent with a Envirogro T5 8 tube grow light installed , we have proven over many years that these cannot be beaten for the propagation of giant onions and further more, for growing on in the tunnel for greenhouse. If you start off the right way as recommended here, we can guarantee you will get much larger onions. Grow lights must also be used in the tunnel where they giant onions are grown, again we recommend using the Envirogro T5 grow lights, we use several T5 Envirogro 4 foot 4 tubes units. These are hung down the sides of the tunnel behind the large pots that the giant onions are to be grown in. Many growers get carried away when trying to too many grow giant onions , its best to grow only about 6 to 10 bulbs, if you grow more your costs will rocket , particularly your electric bill! We use bins that measure only 15 inches high and 15 inches across, the are filled with Coco in particular Canna Coco , it is a very clean beautiful growing media but you must feed it with a growing solution on a weekly basis. Giant onions really grow very well in Canna. Gardeners who wish to have a go at growing giant onions need to be getting ready well in advance of the planting date as theres an awful lot of work required to get ready to be ahead of the game. Here we are ready by early October , all the final planting pots, Coco Media, Grow Tents, Lights, everything. We recommend using only a 8 foot by 8 foot tunnel, this should then be twin skinned by installing bubble polythene inside , if you do this, and install a heater , they are relatively inexpensive to heat and economical to run. Install an air movement fan in the roof of the tunnel. We shall be adding a video very soon of the giant onions in our small tunnel. Stay tuned to our site for more info soon..